Joseph of Arimathea was, according to all four canonical Christian Gospels, the man who assumed responsibility for the burial of Jesus after his crucifixion. A number of stories that developed during the Middle Ages connect him with Glastonbury, where the stories said he founded the earliest Christian oratory, and also with the Holy Grail legend. Joseph of Arimathea is venerated as a saint by the Roman Catholic, Eastern Orthodox, and some Protestant churches. The traditional Roman calendar marked his feast day on March 17, but he is now listed, along with Saint Nicodemus, on August 31 in the Martyrologium Romanum. Eastern Orthodox churches commemorate him on the Third Sunday of Pascha (i.e., the second Sunday after Easter) and on July 31, the date shared by Lutheran churches. Although a series of legends developed during the Middle Ages (perhaps elaborations of early New Testament apocrypha) tied this Joseph to Britain as well as the Holy Grail, he is not currently on the abbreviated liturgical calendar of the Church of England, although this Joseph is on the calendars of some churches of the Anglican communion, such as the Episcopal Church (USA), which commemorates him on August 1. And I will give the wicked for his burial, and the rich for his death; for he practiced no iniquity, nor craft with his mouth. Since the 2nd century, a mass of legendary detail has accumulated around the figure of Joseph of Arimathea in addition to the New Testament references. Joseph is referenced in apocryphal and non-canonical accounts such as the Acts of Pilate, a text often appended to the medieval Gospel of Nicodemus and The Narrative of Joseph, and mentioned in the works of early church historians such as Irenaeus (125–189), Hippolytus (170–236), Tertullian (155–222) and Eusebius (260–340), who added details not found in the canonical accounts. Francis Gigot, writing in the Catholic Encyclopedia, states that "the additional details which are found concerning him in the apocryphal Acta Pilati ("Acts of Pilate"), are unworthy of credence." Hilary of Poitiers (300–367) enriched the legend, and Saint John Chrysostom (347–407), the Patriarch of Constantinople, was the first to write that Joseph was one of the Seventy Apostles appointed in Luke 10. During the late 12th century, Joseph became connected with the Arthurian cycle, appearing in them as the first keeper of the Holy Grail. This idea first appears in Robert de Boron's Joseph d'Arimathie, in which Joseph receives the Grail from an apparition of Jesus and sends it with his followers to Britain. This theme is elaborated upon in Boron's sequels and in subsequent Arthurian works penned by others. Later retellings of the story contend that Joseph of Arimathea himself travelled to Britain and became the first Christian bishop in the Isles, a claim Gigot characterizes as a fable. —  Gospel of Nicodemus. Translated by Alexander Walker. The Jewish elders then captured Joseph, and imprisoned him, and placed a seal on the door to his cell after first posting a guard. Joseph warned the elders, "The Son of God whom you hanged upon the cross, is able to deliver me out of your hands. All your wickedness will return upon you." On the day of the Preparation, about the tenth hour, you shut me in, and I remained there the whole Sabbath in full. And when midnight came, as I was standing and praying, the house where you shut me in was hung up by the four corners, and there was a flashing of light in mine eyes. And I fell to the ground trembling. Then some one lifted me up from the place where I had fallen, and poured over me an abundance of water from the head even to the feet, and put round my nostrils the odour of a wonderful ointment, and rubbed my face with the water itself, as if washing me, and kissed me, and said to me, Joseph, fear not; but open thine eyes, and see who it is that speaks to thee. And looking, I saw Jesus; and being terrified, I thought it was a phantom. And with prayer and the commandments I spoke to him, and he spoke with me. And I said to him: Art thou Rabbi Elias? And he said to me: I am not Elias. And I said: Who art thou, my Lord? And he said to me: I am Jesus, whose body thou didst beg from Pilate, and wrap in clean linen; and thou didst lay a napkin on my face, and didst lay me in thy new tomb, and roll a stone to the door of the tomb. Then I said to him that was speaking to me: Show me, Lord, where I laid thee. And he led me, and showed me the place where I laid him, and the linen which I had put on him, and the napkin which I had wrapped upon his face; and I knew that it was Jesus. And he took hold of me with his hand, and put me in the midst of my house though the gates were shut, and put me in my bed, and said to me: Peace to thee! And he kissed me, and said to me: For forty days go not out of thy house; for, lo, I go to my brethren into Galilee. According to the Gospel of Nicodemus, Joseph testified to the Jewish elders, and specifically to chief priests Caiaphas and Annas that Jesus had risen from the dead and ascended to heaven and he indicated that others were raised from the dead at the resurrection of Christ (repeating Matt 27:52–53). He specifically identified the two sons of the high-priest Simeon (again in Luke 2:25–35). The elders Annas, Caiaphas, Nicodemus, and Joseph himself, along with Gamaliel under whom Paul of Tarsus studied, travelled to Arimathea to interview Simeon's sons Charinus and Lenthius. Medieval interest in Joseph centered on two themes, that of Joseph as the founder of British Christianity (even before it had taken hold in Rome), and that of Joseph as the original guardian of the Holy Grail. Legends about the arrival of Christianity in Britain abounded during the Middle Ages. Early writers do not connect Joseph to this activity, however. Tertullian (AD 155–222) wrote in Adversus Judaeos that Britain had already received and accepted the Gospel in his lifetime, writing, "all the limits of the Spains, and the diverse nations of the Gauls, and the haunts of the Britons—inaccessible to the Romans, but subjugated to Christ." Tertullian does not say how the Gospel came to Britain before AD 222. However, Eusebius of Caesarea, (AD 260–340), one of the earliest and most comprehensive of church historians, wrote of Christ's disciples in Demonstratio Evangelica, saying that "some have crossed the Ocean and reached the Isles of Britain." Saint Hilary of Poitiers (AD 300–376) also wrote that the Apostles had built churches and that the Gospel had passed into Britain. The writings of Pseudo-Hippolytus include a list of the seventy disciples whom Jesus sent forth in Luke 10, one of which is Aristobulus of Romans 16:10, called "bishop of Britain". 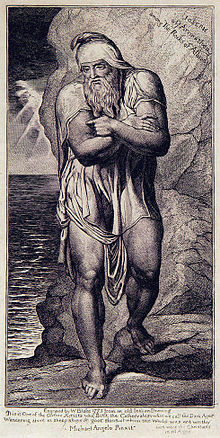 In 1989 A. W. Smith critically examined the accretion of legends around Joseph of Arimathea, by which the poem hymn of William Blake And did those feet in ancient time is commonly held as "an almost secret yet passionately held article of faith among certain otherwise quite orthodox Christians" and Smith concluded "that there was little reason to believe that an oral tradition concerning a visit made by Jesus to Britain existed before the early part of the twentieth century". Sabine Baring-Gould recounted a Cornish story how "Joseph of Arimathea came in a boat to Cornwall, and brought the child Jesus with him, and the latter taught him how to extract the tin and purge it of its wolfram. This story possibly grew out of the fact that the Jews under the Angevin kings farmed the tin of Cornwall." In its most developed version, Joseph, a tin merchant, visited Cornwall, accompanied by his nephew, the boy Jesus. Reverend C.C. Dobson (1879–1960) made a case for the authenticity of the Glastonbury legenda. The case was argued more recently by the latter church minister Dr Gordon Strachan (1934–2010)  and by the former archaeologist Dennis Price. The legend that Joseph was given the responsibility of keeping the Holy Grail was the product of Robert de Boron, who essentially expanded upon stories from Acts of Pilate. In Boron's Joseph d'Arimathe, Joseph is imprisoned much as in the Acts, but it is the Grail that sustains him during his captivity. Upon his release he founds his company of followers, who take the Grail to Britain, though Joseph himself does not go. The origin of the association between Joseph and Britain is not entirely clear, though in subsequent romances such as Perlesvaus, Joseph himself travels to Britain, bringing relics with him. In the Lancelot-Grail Cycle, a vast Arthurian composition that took much from Robert, it is not Joseph but his son Josephus who is considered the primary holy man of Britain. Helaius, Nepos Joseph, Genuit Josus, Josue Genuit Aminadab, Aminadab Genuit Filium, qui Genuit Ygernam, de qua Rex Pen-Dragon, Genuit Nobilem et Famosum Regum Arthurum, per Quod Patet, Quod Rex Arthurus de Stirpe Joseph descendit. Elizabeth I cited Joseph's missionary work in England when she told Roman Catholic bishops that the Church of England pre-dated the Roman Church in England. When Joseph set his walking staff on the ground to sleep, it miraculously took root, leafed out, and blossomed as the "Glastonbury Thorn". The retelling of such miracles encouraged the pilgrim trade at Glastonbury until the Abbey was dissolved in 1539, during the English Reformation. Continuing her flight to Ely, Etheldreda halted for some days at Alfham, near Wintringham, where she founded a church; and near this place occurred the "miracle of her staff." Wearied with her journey, she one day slept by the wayside, having fixed her staff in the ground at her head. On waking she found the dry staff had burst into leaf; it became an ash tree, the "greatest tree in all that country;" and the place of her rest, where a church was afterwards built, became known as "Etheldredestow." —  Richard John King, 1862, in: Handbook of the Cathedrals of England; Eastern division: Oxford, Peterborough, Norwich, Ely, Lincoln. Medieval interest in genealogy raised claims that Joseph was a relative of Jesus; specifically, Mary's uncle, or according to some genealogies, Joseph's uncle. A genealogy for the family of Joseph of Arimathea and the history of his further adventures in the east provide material for Holy Grail romances Estoire del Saint Graal, Perlesvaus, and the Queste del Saint Graal. Another legend, as recorded in Flores Historiarum is that Joseph is in fact the Wandering Jew, a man cursed by Jesus to walk the Earth until the Second Coming. 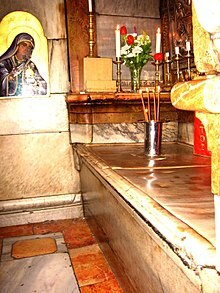 Arimathea itself is not otherwise documented, though it was "a town of Judea" according to Luke 23:51. Arimathea is usually identified with either Ramleh or Ramathaim-Zophim, where David came to Samuel (1 Samuel chapter 19). ^ Thomas Craughwell (2005). "A Patron Saint for Funeral Directors". Catholicherald.com. Retrieved September 14, 2011. ^ Kinnaman, Scott A. (2010). Lutheranism 101. St. Louis, MO: Concordia Publishing House. p. 278. ISBN 978-0-7586-2505-2. ^ E.g. Ben Witherington III, John's Wisdom: A Commentary on the Fourth Gospel, 1995, and Andreas J. Köstenberger in Commentary on the New Testament Use of the Old Testament, 2007, on John 19:38–42. ^ a b "Joseph of Arimathea". The Catholic Encyclopedia. New York: Robert Appleton Company. 1910. Retrieved 13 Dec 2014. ^ John Chrysostom, Homilies of St. John Chrysostom on the Gospel of John. ^ Finally, the story of the translation of the body of Joseph of Arimathea from Jerusalem to Moyenmonstre (Diocese of Toul) originated late and is unreliable." ^ "CHURCH FATHERS: On the Apostles and Disciples (Pseudo-Hippolytus)". newadvent.org. ^ Smith, "'And Did Those Feet...? ': The 'Legend' of Christ's Visit to Britain" Folklore 100.1 (1989), pp. 63–83. ^ S. Baring-Gould, A Book of The West: Being An Introduction To Devon and Cornwall (2 Volumes, Methuen Publishing, 1899); A Book of Cornwall, Second Edition 1902, New Edition, 1906, page 57. ^ Dobson, Did Our Lord Visit Britain as they say in Cornwall and Somerset? (Glastonbury: Avalon Press) 1936. ^ "Elizabeth's 1559 reply to the Catholic bishops". fordham.edu. ^ C. Scott Littleton, Linda A. Malcor, From Scythia to Camelot: a radical reassessment of the legends of King Arthur, the Knights of the Round Table and the Holy Grail (1994) 2000:310. ^ Percy, Thomas (2001) . Reliques of Ancient English Poetry. 2. Adamant Media Corporation. p. 246. ISBN 1-4021-7380-6. 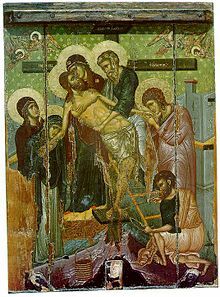 Wikimedia Commons has media related to Joseph of Arimathea.